Colour theme inspiration on the blog today, inspired by what I’m wearing – a black and white striped t-shirt with coral nails and lipstick. I adore this combination of stripes with a coral colour pop, it’s fresh and oh so pretty. 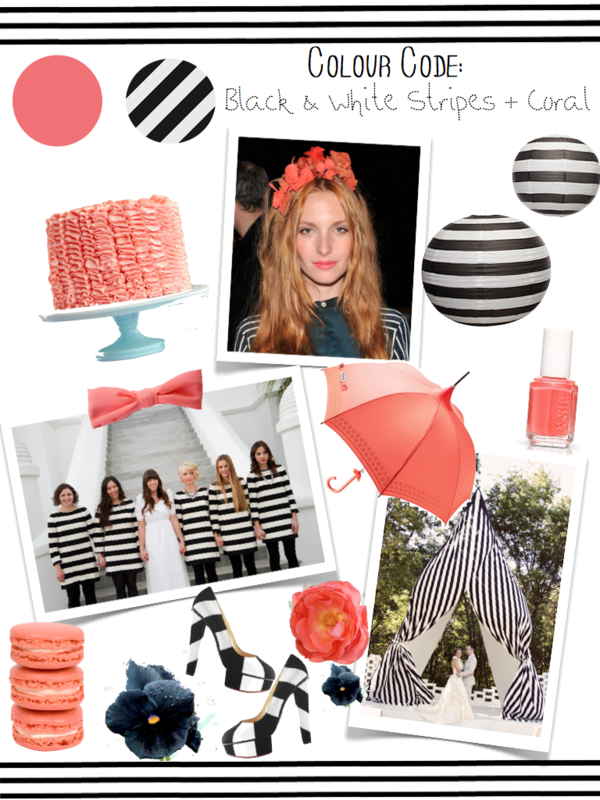 Black, White, Coral are a winning combination but using black and white stripes keeps it contemporary and fun. Teaming your Wedding dress with striped shoes or a striped jacket would make a great statement. And instead of a standard French polish or a neutral nail, jazz up your Bridal fingers with coral polish or a black and white stripe nail art finish. Floral Crowns are having a moment in Bridal fashion but if you aren’t ready for a full crown make like Josephine De La Baume and colour pop floral headband. Orchids are particularly easy to wear in the hair if you fancy wearing fresh flowers.